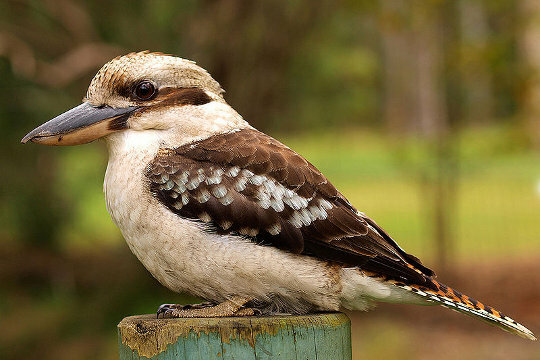 My new friend, the kookaburra (I named him “Kooky” as a form of endearment), hasn’t given up yet. After he still continued to attack his own reflection in the big window pane downstairs (hence continued to crash against the window), Geoffrey covered the window with a cloth. However this just diverted the poor bird that took to attack his reflection in the car’s side window and the toilet window upstairs. Well, how can I put it, I was completely shocked when I was using the toilet and did what people with a functioning digestion system have to do every now and then, when something crashed against the window above me and I thought the window pane would be smashed to smithereens. I immediately knew that Kooky had found a new target. Kooky, you are just the craziest bird I have ever seen in my entire life. O’zapft is… more or less, even in Brisbane! Well, the Oktoberfest in Brisbane is just a wee bit smaller than the original in Munich, however they did made an effort here! The Oktoberfest was staged at the RNA Showgrounds, they put up one big tent and sold (near) traditional German food at some food stalls outside the tent. Despite the rain (it was pouring cats and dogs…) there was a nice atmosphere at the venue, they had even flown in a music band from Munich, did some yodeling performances and involved the visitors in some Bavarian-style dance-shows. It was more of a family get-together than anything, and I liked it. The “King of Cakes”, a Bavarian bakery, supplied pretzels and pastries, German bratwurst was served with kraut in bread rolls and decent beer was on offer ranging from lager to wheat beer. It was a real pity that it was just raining, I would have loved to sit outside where they had put up benches and tables (the real “Bierzeltgarnituren”) underneath beautiful, exotic trees. It was my first Oktoberfest far away from home, with ibis birds walking around and beer served in half-liter glasses only. I thought it was fun. I know I am repeating myself again (and again and again), but things are simply different here. It’s not enough that we experience an offset of six months in our seasons compared to the northern hemisphere. I understand that and I will eventually get adjusted, I promise. But, as we are in Australia, spring doesn’t start on 21 September, oh no, my Australian host country simply declared the official start of spring to be on 1 September. No relation to solstice or equinox, no, why should we follow what the rest of the world does, this is Australia. And don’t get me wrong, I still find it very charming and agreeable to live here. Things are just – different. Now, winter here was not a real winter, even if people were talking about chilly mornings, put on their warmest coats, gloves and scarves. Coming from central Europe, a day with daytime temperatures up to 24°C and 7-8°C during the night cannot be regarded as a winter day. The interesting thing is, that with beginning of September you really noticed an increase in daytime temperatures – and unfortunately also in humidity. And this is just the beginning. By December/January it will be unbearably hot and humid, just when people celebrate Christmas. I am already looking forward to it! 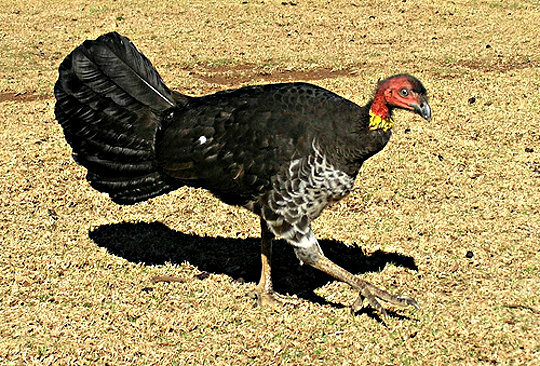 It is due time for me to dedicate a post to Australian birds. Funny birds they are at times, I can tell you that much. It was sometime in August when I was riding my bike and turned around a corner when suddenly I realized that a flying bird almost hit my helmet. I was thinking that the bird might have not seen me when it was in full flight and I turned around the corner, but the bird came back and I realized it was attacking my helmet! 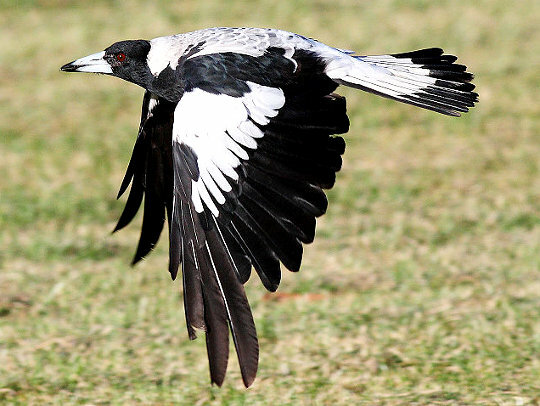 I was rather startled, and when I asked my friend later that week, he explained to me that during nesting season magpie birds (the Australian “Elster”) attack people riding on pushbikes obviously to protect their nests and chicks. Later I saw people riding pushbikes and wearing helmets with spikey cable straps attached to their helmets in order to shy away these slightly aggressive birds. Another real strange thing however happened when I was visiting a friend of mine at his house, and we repeatedly heard a thump as if something was pounding against a window. Believe it or not, it was a kookaburra who obviously saw its own reflection in the window and tried to attack an apparent opponent it in an attempt to protect the hen that was nesting in a tree nearby. The poor fellow flew against the window pane again and again, I mean, he really crashed against the window and probably only its strong beak protected him from major injuries, but he just wouldn’t learn and stop it! I observed him standing just behind the window inside the house when it flew against the pane, and sometimes he would do it several times within a minute. This bird was mental! The only good thing about it was that I was able to see this fantastic bird in full flight literally only centimetres away from my own eyes and head. Wildlife in Australia is just crazy! I took a five and a half hours flight across the whole continent, for an extended weekend trip to visit my cousin in Perth. It was a lovely trip, I enjoyed the days in Perth and Fremantle, and then of course our trip down to the Margaret River area. As people say, Perth is the remotest city in the world. You take a look at the map, and to the left (westwards) there is water (the Indian Ocean), to the right (in eastern direction) there are a few hills, and then: the vast open outback, for thousands of miles in all directions. Perth itself is a very pleasant city, not too big, still well-sized, sitting on the waters of the Swan River which widens up as it reaches the city. As in all Australian cities close to the sea people enjoy an outdoorsy kind of life-style and they have every reason to do so. The magnificent parklands of Kings Park sit elevated above the city and the Swan River; when we took an extended walk (or better: photo excursion) in the park the native Kangaroo Paw plants were fully blossoming. We took a two-days drive to the Margaret River area, and I have to admit that I was very positively surprised. It was the beginning of spring when we were there, everything was lushly green, for some funny reason the landscape and scenery reminded me of the area where I grew up in northern Germany. Black-and-white Friesian cows were grazing in the meadows, small little farmhouses sat along the road. But again, this is Australia, a different world, and colourful green-blue-red parrots were flying through the air and when dusk set in kangaroos came bouncing out of the bush, hopping alongside or across the road. Closer to the town of Margaret River you find an abundance of vineyards and wineries, and we did stop and had our tastings. Beautiful Semillon-Sauvignon Blancs, Chardonnays, Cab Sauvs, Shiraz’, Rieslings and other wines were on offer; and as usual, the same grape variety gives different wines with different aromas at each different winery. It was a journey of indulgence, accompanied by visits to a cheese factory, a venison farm, and the renowned Margaret River Chocolate Factory. I was in heaven! The great thing about this beautiful area is, that it is so close to the ocean. A few minutes drive and you hit yet another beautiful beach. At one beach we noticed flowers laid down at the top of a staircase leading down onto the beach. We realized this must have been the beach were only a couple of weeks ago a surfer was killed during a shark attack. I didn’t feel at ease when I thought about it. I looked out on the water, the surf was good, maybe a bit rough, probably ideal conditions for an experienced surfer. 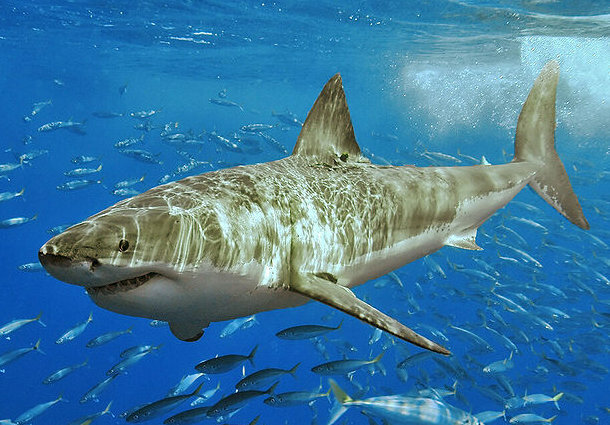 Knowing that near the coastline somewhere in the water there were the Great White sharks was not a very comforting feeling. But I guess that’s nature, here you get it all, the beauty and the beast.